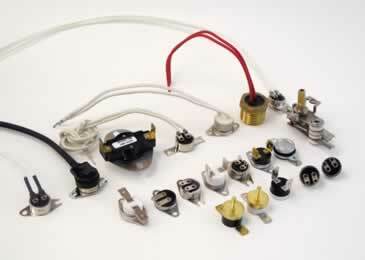 Thermostats | Bimetal Thermostats, Switch Thermostats, & More - Comstat, Inc.
Comstat maintains diverse assortment of in-stock standard products, including switch thermostats and bimetal thermostats. This allows us to ship most orders immediately and with a low $50 minimum order. If you are an OEM in need of a custom thermostat, check out our Thermostat Design Configurator or contact us to speak directly with a member of the highly knowledgeable Comstat team. What is a thermostat and how do they work? Thermostats are temperature-sensitive components used to either maintain the operating temperature of a system or to break an electrical connection should a system’s temperature deviate from its desired range. The thermostat accomplishes this by switching heating or cooling devices on or off, or by regulating the flow of heat transfer fluid as needed. Thermostats are often essential for controlling the functionality of a system and for preventing damage while ensuring safety. Thermostats are either mechanical or electronic. Mechanical Snap Disc or switch thermostats are by far the most common thermostat used in applications ranging from complex industrial machinery to controlling simple commercial appliances and HVAC systems. The Snap Disc thermostat is mounted directly on the surface of the device being controlled. It mechanically makes and breaks a contact that switches the power supply of a heating or cooling device on or off automatically as the temperature rises and falls. Electronic thermostats differ mainly in that they are usually mounted remotely and their temperature inputs are provided by separate temperature sensors, such as thermocouples, RTDs, and thermistors, rather than an internal bimetal component. Electronic thermostats also often have displays for visual monitoring of the process temperature.